The South Korean government may lower tariffs on commodities including crude oil to help manufacturers grappling with higher cost on top of sluggish demand. 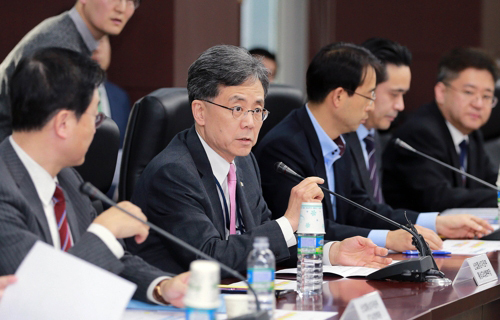 The Ministry of Trade, Industry and Energy held a meeting chaired by Trade Minister Kim Hyun-jong with representatives from manufacturers of various types amid contracting exports. Oil refiners and petrochemical firms asked the government to lower the current 3 percent tariff on oil imports, according to the ministry. Secondary battery manufacturers called for a temporary cut in import levy on raw materials such as cathodes, anodes and rare earth metals, and others demanded the government to accelerate the completion of free trade pacts with major trading nations in Latin America and Middle East. In addition, companies with low credit rating and no assets to put up as security asked for easier access to loans to enter the global market because they are generally shunned by commercial banks due to the high risks. The government said it will draw up a set of supporting measures to reflect the demands by the firms and also come up with plans to stimulate exports, improve export fundamentals and reform export ecosystem. The measures will be finalized at the end of this month or early March, according to the government. The slowdown in exports is feared to pose a big threat to the nation’s export-driven economy. The country’s exports tumbled for two months in a row in January due to the contracted shipments of semiconductors that make up nearly 20 percent of the exports. Petroleum and petrochemical exports also fell on weakening oil prices.